Displaced by Colombia’s armed conflict, this family now lives in Arjona, an impoverished community outside Cartagena on the northern coast. 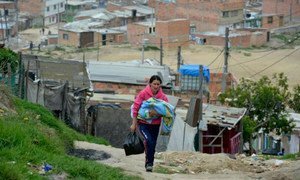 The United Nations refugee agency today called on the negotiators of Colombian peace talks to give special attention to the rights of victims of five-decade conflict that has produced the world’s second-biggest displacement situation after Syria. Spokesperson Adrian Edwards of the Office of the UN High Commissioner for Refugees (UNHCR) said that some 6.7 million people are displaced inside the country – around 13 per cent of the entire population. And 360,000 officially recognized refugees have fled abroad: mostly to Ecuador, which hosts the largest number of refugees in Latin America, and to Venezuela, home to around 170,000 Colombians in need of international protection. UNHCR welcomed the announcement on 30 March by the Government of Colombia and an armed group, known as the National Liberation Army (ELN), that they would start formal peace talks aimed at ending more than half a century of fighting. The spokesperson said that UNHCR supports the active involvement of refugees and internally displaced people in peace negotiations, recalling that more than 60 victims had participated in the Havana negotiations between the Government and the FARC (Revolutionary Armed Forces of Colombia-People's Army). “UNHCR believes that a positive outcome to the negotiations will open the way for reintegration of the internally displaced and returning refugees, resulting over time in an improved human rights situation and in economic and social development in remote areas, including the country’s borders,” Mr. Edwards said. In the meantime, Colombian refugees and asylum-seekers will continue to need international protection in asylum countries, and the voluntary character of repatriations should be maintained, he said, stressing that UNHCR is ready to support the Government in its efforts to restore the rights of Colombian internally displaced people and returning refugees and address their protection and assistance needs. Regional frameworks, such as tripartite mechanisms, voluntary repatriation agreements, reintegration strategies and public policy for local integration, especially in urban settings, are vital to building a sustainable peace, he said. In Colombia, UNHCR has been involved in a Transitional Solutions Initiative, which has helped displaced communities obtain housing, land and livelihoods opportunities and has contributed to their enjoyment of basic rights and the strengthening of communities. Some 38,700 people have benefitted in 17 localities. In Ecuador, a separate Comprehensive Solutions Initiative has, in a similar way, helped Colombian refugees and asylum-seekers enjoy their rights to health, education, employment and housing, and provided them with legal support and advice. In Venezuela, local integration efforts focus on the issuance of documentation to help people gain meaningful protection including effective access to health, education, housing and livelihood opportunities. United Nations Secretary-General Ban Ki-moon has welcomed today's announcement of the launching of peace talks between the Government of Colombia and the National Liberation Army (ELN), following the signing of an agreement between the parties.